Vanilla beans are a great way for the adventurous homebrewer to impart a different and unique flavor to their beers. These Bourbon Vanilla Beans from Papua New Guinea are fresh, (unlike the dry beans you typically see in grocery stores) and ready to be used in whatever beer you like. Arrived very dry and not very aromatic, sliced em up and tossed them in the secondary for a chocolate stout... flavor is there, but not as high quality as expected. Was hoping for Madagascar beans. These are from Guinea. The porter is conditioning now. Time will tell. I purchased these beans for round two of a Vanilla Porter all-grain recipe. I made my original purchase for round one from an online vendor that specializes in vanilla beans, however I wanted them quicker so I took a chance based on other reviews. I was really impressed with the quality - for two-thirds of the price of what I paid in "round one". Beans were a little smaller however they were fresh and full of soft oily goodness - and my beer turned out really nice. Package has three beans and for reference I gutted and chopped all three and put them into a 5 gallon keg. Gave the beer a nice aroma and even better taste. Very fresh beans! I added all three to a vanilla oatmeal Stout and the flavor was awesome. I would definitely order again . Great vanilla beans. I used 2 recently in a stout with THCO cocoa beans. Gave off a nice vanilla aroma and flavor. Great product but new price is CRAZY!!! No other vanilla beans I've tried come close to these in freshness. These babies just ooze sticky goodness. The vanilla beans I've purchased from other sources were very dry, but these are wet with stickiness. The vanilla flavor extras better than the average bean as well. This is the only place I'll buy vanilla beans from now on. Added 3 beans to fermentation for 2 weeks to a Oatmeal Stout. It had a great after taste that wasn't real overpowering. I used these beans in secondary for a vanilla blonde I brewed and the beer was a big hit. the beans have a natural flavor that really comes through. Added the beans to my secondary fermentation and couldn't be more happy with the results! My favorite compliment from a neighbor: "this is the best beer I ever tasted." Thanks MoreBeer for providing an excellent product at a very good price! Made a nice addition to my stout. I purchased a package of these vanilla beans for an Imperial Stout I had brewed. I split and scraped two beans, then added the contents with oak chips and bourbon to the secondary. Ended up with quite the vanilla flavor when finally kegged and served. In hindsight I wish I had only added one bean as two had manage to overpower two ounces of medium toast french oak chips and 4oz of bourbon but that's on me. Great vanilla flavor from well package beans that were not dried out upon arrival. A little dry, but it's great for beer or making your own vanilla extract. Can't beat the price! Best vanilla beans I've ever used. Just one or two beans will give you a great flavoring. Well worth the price, which is not bad either. This is a great ingredient to add to any stouts or porters as well as when oaking any of your beers. This can be found in most specialty supermarkets...but truly a great price and fresh from MoreBeer! High quality beans that did the perfect job in a recent vanilla porter! Just one bean, aged 6 weeks in secondary, great results. Used 1 vanilla bean. Scraped out the sticky seeds inside and chopped into approx. 1 cm lengths. Put the seeds and chopped bits into an empty carboy and transferred a 5.5% ABV stout on top. Allowed to age for 6 weeks with the vanilla. The vanilla came through VERY nicely. I was surprised that just 1 bean with some time produced such a pronounced and smooth, vanilla aroma and flavor. 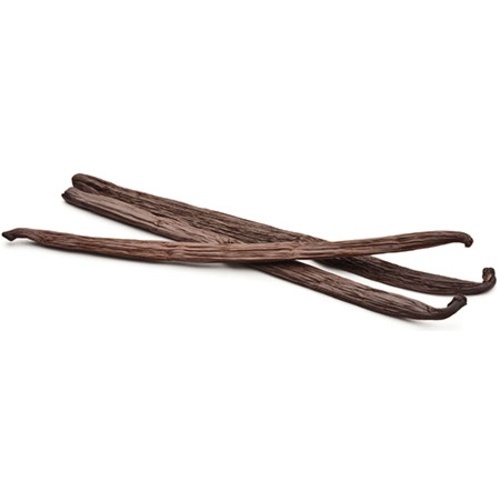 Yes, you can buy vanilla beans at various online or local shops. However, the quality of the prodcut and packaging have sold me on MoreBeer! The beans were very fresh and the quality was excellent. I will buy all of my vanilla beans from here. Makes a good addition to any dark beer.